Twelve miles from Sunset Park to Maspeth. I usually head for Princeton, NJ on Thanksgiving, as the cousins in West Windsor put out a spread. This year, circumstances changed and I was on my own on Thursday, attending a separate gathering at another cousin’s in Plainview on Saturday. Still, I wanted to do something special on Thanksgiving and so, I planned an epic walk. I decided to walk from Sunset Park to Maspeth: the 8th Avenue station on the N train to the Q18 bus stop at Grand Avenue and 69th Street, whose bus would deliver me in 20 minutes to the Long Island Rail Road in Woodside and thence back home to Little Neck. The plan worked. As it turned out, it was a walk of almost exactly 12 miles. My back and feet got a little hurt and tired, but I was back in fine form the following day. And, such a distance is really nothing special because I have a couple of friends on Facebook who routinely take 25 to 30 mile walks, all within New York City. It’s all about building up stamina. Two things worked against perfection: the short November day and my penchant for close, keen observation. It led to some detours, as at times I noticed something a block away that piqued my curiosity. During the walk, I clicked my camera shutter 315 times. Today, I’ll share just a few of my discoveries. My friend Brian, told of my plan, had some advice. “If you get shot, apply pressure to the wound and stay awake. If you lose consciousness, a Good Samaritan might do CPR and push all the blood out of you through the bullet hole. I learned that in the CPR class and then saw that exact scenario on an episode of Castle. 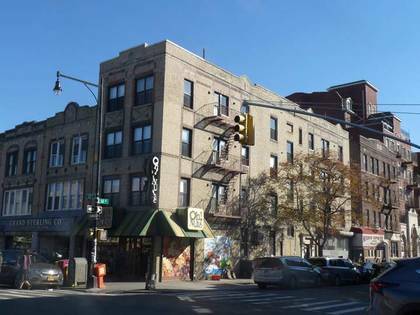 The above photo shows the Soccer Tavern on 8th Avenue just off 60th Street. I remember passing it on the B70 8th Avenue bus in the 1970s. It was likely named for the nearby soccer fields, which were known as the Dust Bowl before they were Astroturfed. It has served a variety of nationalities over the years. The Irish, American, and Norwegian flags wave above its front door, while it is surrounded on all sides by signage in Chinese. Since the 1980s, Fuzhounese Chinese have made Sunset Park into New York City’s second-largest Chinatown, but the Soccer Tavern has retained its original clientele, even while becoming more inclusive. The Lunar New Year is one of the Tavern’s biggest weeks, while at the annual Christmas potluck lunch the Chinese regulars supply an entire suckling pig. This place is a TV series waiting to happen. For several decades Borough Park has had a majority Jewish population, much of them Hasidic with a good number of Orthodox mixed in. 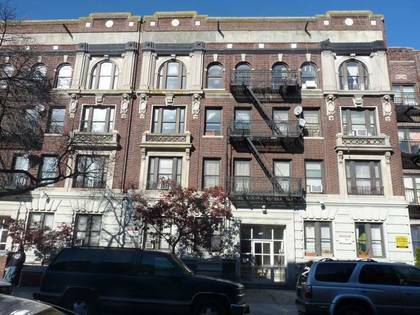 In this building at 13th Avenue and 50th Street was the apartment of my aunt, uncle, and three cousins (whose homes in West Windsor and Plainview I visit during the holidays). I would be a frequent visitor here. My aunt and uncle had many friends in the neighborhood, some of them Irish immigrants from Newfoundland, others Jewish, such as one of my aunt’s closest friends, a woman named Miriam who ran the candy store across the street; my aunt was a patron of the now-vanished Ossie’s fish market, while cousin Eileen was a cashier at the still-existing Lane Drugs a few blocks away. My memories of Borough Park aren’t all pleasant; my childhood physician, Dr. Levine, with his needles and poking and prodding, was on 49th Street. 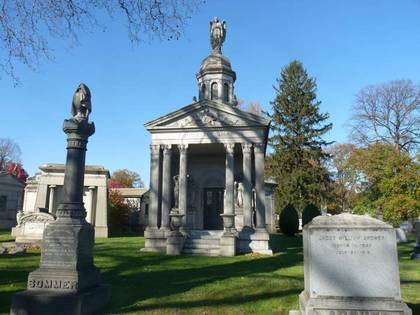 I knew I had to duck into Green-Wood Cemetery, whose back entrance gate, and magnificent pair of Victorian-era gatehouses, are on Fort Hamilton Parkway just west of Dahill Road. Entering, I paid my respects to hot dog king Charles Feltman, who operated a food wagon in Coney Island beginning in 1867, and by 1874 the profits from his hot dogs enabled him to build his Feltman’s Ocean Pavilion. By 1946, when the restaurant finally closed, billions of frankfurters (also called since the sausage on roll treat had arisen in Frankfurt, Germany as early as the 1500s) had been sold. His protégé, Nathan Handwerker, eventually supplanted him as Coney’s ultimate franks flogger. Most fans of the master of macabre, the ghostly gentleman H.P. Lovecraft, know that he spent a couple of unhappy years in Brooklyn, separated from his beloved Providence. His tenure on Clinton Street in Brooklyn Heights, a slum in the early 1920s, is best known by fans; he moved there after his wife Sonia Haft Greene, moved to Cleveland to set up a millinery business after Lovecraft’s stories sold only sporadically and he was unable to gain any other employment. After marrying at St. Paul’s Chapel in lower Manhattan, the couple resided here at what had been Greene’s residence for about a year. A couple of blocks east of here, I bumped into Mark Levy, who with his sons runs the very successful NYC tourism service, Levy’s Unique New York. He was volunteering in a soup kitchen and invited me in for a bite, but I noticed the November light was already getting stingy, and I continued on. The Levys’ New York city trivia quiz, the Panorama Challenge, happens every March at the Queens museum in Flushing Meadows. My team came in first in its first year, and I’ve volunteered every year since—until they let me play again. 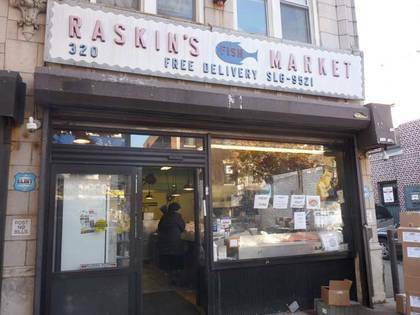 I was surprised by how much, on this Thanksgiving Day, it was business as usual in so many parts of town, from the fish markets of Crown Heights to the barbershops of Bedford-Stuyvesant. When I was a kid, nothing—absolutely nothing—would be open in Bay Ridge, save some Chinese restaurants and maybe a candy store. Above, Raskin’s Fish Market, with a plastic-lettered sign that goes back to the 1960s, when the SL stood for Slocum. On the border of Crown Heights, Bedford-Stuyvesant, and Weeksville, two alleys protrude north from Atalantic Avenue between Kingston and Albany Avenues. Atlantic for the most part is a relentless stretch of auto body shops, gas stations, and light manufacturing along the Long Island Rail Road, which runs down the middle of the street on an elevated trestle. They stand out with their detailed and ornamented exteriors, with corner cupolas and turrets. 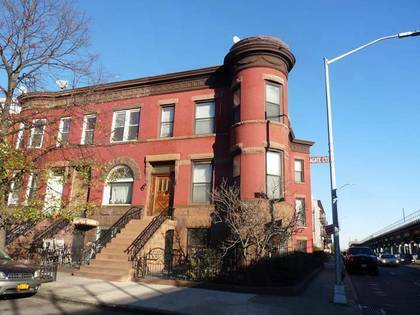 Both have recently been given NYC Landmark status in a small district. The two-court complex was built for Swiss industrialist Florian Grosjean, who set up an importing business with French businessman Charles Lalance in 1850. The firm gradually expanded into a variety of products, including housewares, champagne, tinware, sheet metal, and hardware. L&G became a nationally renowned manufacturer that was among the first to make porcelain enamelware, a cheaper, lighter alternative to heavy cast-iron cookware, under their brand name, “Agate Ware.” Eventually L&G operated a small company town in Woodhaven, with a number of brick manufacturing plants along Atlantic Avenue of which the 1876 clock tower is the only survivor. Workers’ housing nearby along 95th Avenue and elsewhere does survive, but in a heavily altered condition. Alice Court was named for Grosjean’s daughter, Alice Marie, and the Agate Ware in which he had made his fortune. After a lengthy stretch through the Bedford-Stuyvesant brownstones, the former RKO Bushwick Theater makes a surprising appearance at the triangle formed by Broadway, Monroe Street, and Howard Avenue. It was constructed in 1911—over 25 years after the Broadway El was constructed—so it’s rather surprising that such an ornately appointed building would appear next to such a thorough obstruction. 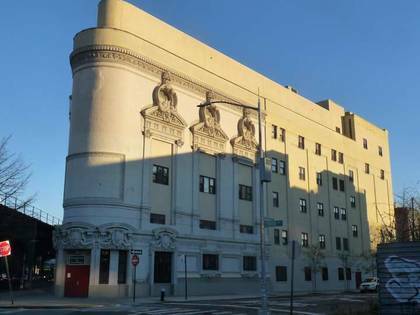 Nevertheless, architect William McElfatrick persisted and festooned the Bushwick with Beaux-Arts ornamentation, with cherubs, angels and peering faces, with lyres, tambourines and other symbols of musical fare. Its interior was well-appointed, too, with painted murals on the ceiling. In 1912, the theatre was sold to the organization headed by entrepreneur and showman Benjamin Franklin Keith and became part of the “RKO” circuit. Vaudeville stage shows alternated with films until the 1930s, when movies took over. The Bushwick closed in 1969, became a church for awhile, then spent several decades in abandoned and decrepit condition (during which time the Martin Sheen/Robert Loggia film The Believers was shot using the interior). The old theater was finally restored in the early 2000s when The Brooklyn School for Law & Technology took over. 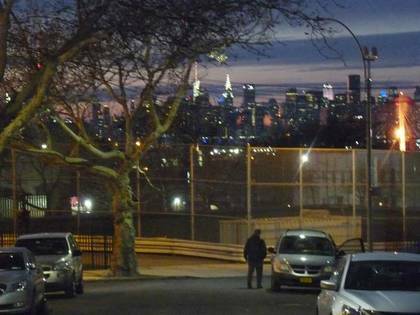 Dusk was in control as I walked through Ridgewood and scaled little-renowned Tonsor Street. A choice view of The Shining City can be had as it winds around a hill toward Metropolitan Avenue. The street was laid out around 1915 as Amory Street, but in 1931 the massive Grover Cleveland High School and its huge athletic field were constructed beside the street. After Cleveland’s first principal, Charles Augustus Tonsor, passed away, Amory Street was given his surname. Modern practice would simply have added a second street sign with his full name above the original. With just a minimum of ache in my lower back, shins, and feet, I attained my goal, the Maspeth Federal Savings Bank at Grand Avenue and 69th Street, about seven hours after starting out at the 8th Avenue N train. 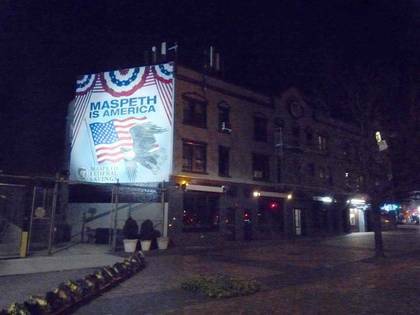 “Maspeth Is America,” the sign proclaims, and the neighborhood is something of an oasis in Queens; it remains Republican and overall conservative in its politics and flags abound on patriotic national holidays. Its Memorial Day parade is one of the city’s largest and is rivaled only by the one in Little Neck (which some don’t even count, as it begins in Great Neck in Nassau County). I was amazed to find when checking my iPhone that the walk had been just 12 miles; it felt like more, but I’m new at this long-distance walking business. If I stick with it, I imagine this will be a stroll to the deli compared with what I would be able to do in the future, especially when days get longer again.